Recently there has been a lot of talk about privacy online. Its now accepted that various protocols used to secure the internet are now no longer secure and don’t give users the online privacy they would require. SSL v3.0, TLS 1.0 and TLS 1.1 are the protocols that are open to attack, these are used to secure HTTPS traffic between a client and server. As a result PCI DSS has started to make plans to force online stores to move to TLS 1.1 but this isn’t to 2018 and TLS 1.1 is not considered secure enough. Several payment gateways and shipping providers have already implemented their own plans to make their services secure by removing support for the insecure protocols. UPS has already disabled support for anything other than TLS 1.2. This is the current gold standard for ensuring that the traffic is secure. Paypal have announced that in June 2016 they too will only support TLS 1.2. So what does this mean from Cart Viper customers? Cart Viper is built with .net Framework 4.0 which does not have support to TLS 1.2. We have had to compile Cart Viper against .net 4.5.1 which does have support for TLS 1.2. .net Framework 4.5.1 was released in 2013 so it should be already installed on your server and you won’t need to change your application pool. All customers that use UPS and Paypal need to upgrade to Cart Viper 3.5 or greater now to ensure they have continued service with the third parties which are only supporting TLS 1.2. If you already have a license you can just download the free trial and once installed this will unlock to a full version. New to the range of modules we have developed is NewsViper. Competing with some already popular modules on DNN, NewsViper is our take on what you need to get the job done. NewsViper allows you to create news, articles, press releases, blog etc for any DNN portal. Designed to the same high standards as our existing modules and all backed up with our great support. At only $49 for a single portal and option to purchase an enterprise wide license at $199 we believe this offers excellent value for money. Remember we never charge for upgrades, so you get free lifetime upgrades. Out of the box the module uses Razor templates to control the layout. This gives you complete control over the layout of the module, we don’t inject any html so your templates are whatever you design. Using Razor templates gives you virtually limitless customization. With three themes to style the module and the ability to customize the CSS, making great looking news articles has never been easier. 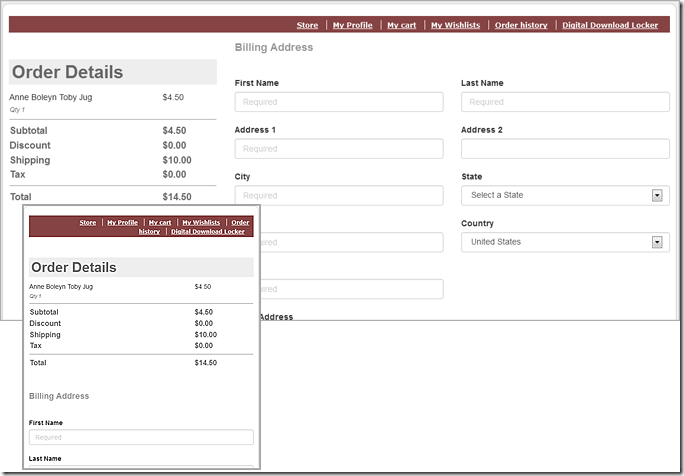 Its responsive out of the box, with all the classes based on Bootstrap3. Have great looking page content whatever the visitor’s device. Track all changes to an article and rollback to a previous version at the click of a button. Never lose a change again. Allow your visitors to leave a rating and comment on the news article. AJAX based back office to make creating and managing your news articles a breeze. 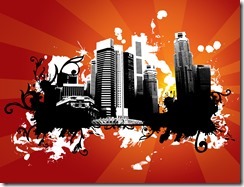 What platform is DNN based on? Send your answer to enquiries@cartviper.com to have a change of winning a free News Viper license. Closing date 9AM EST 16th October 2015. If you want to start selling anything online using DNNCMS then you need to take a look at Cart Viper. 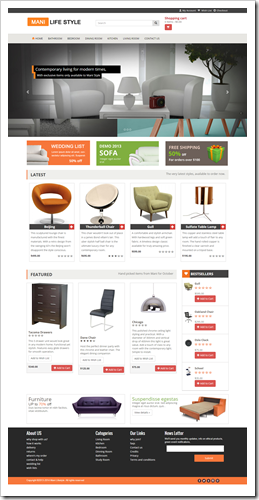 Cart Viper is the best value for money ecommerce module for DNN. Its packed with advanced features that our competitors would have you pay extra for. The built-in template system supports Razor scripts. Create amazing looking stores with ease. Selling digital downloads? We can secure provide access to your clients once they purchase the item. Want to store the file in Azure or Amazon S3, no problem we can do that too. All secured to stop unauthorized access. Unlike our competitors, once you purchase a Cart Viper license you get free upgrades. Never pay another penny to get the latest version. To celebrate the Holidays we are offering 10% off any purchases made before January 1st 2015. To get the discount use the code CVHolidays at the DNN Store. 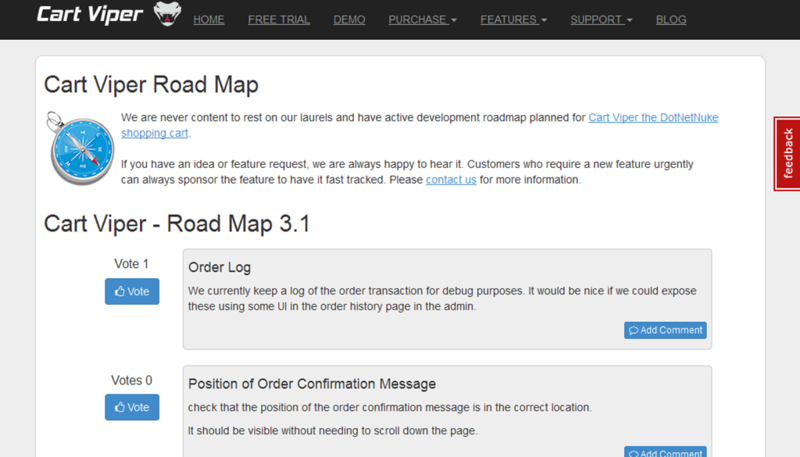 The Cart Viper demo site was updated a while ago and we’ve had positive feedback from the DNN community. The site uses Twitter Bootstrap 3 and some razor scripts to demonstrate how easy it is to create great looking ecommerce sites using Cart Viper. With only a small amount of customization you can make a great looking ecommerce site which works great on mobile, tablet and desktop screens. A number of people has asked us to release the skin and files we used to make the site. So in the blog post we are going to step through the process of how to install the files and give you some pointers where you can further customize the demo. To get started we need to make a home page, store page, my account page and then just add the store admin page to the admin menu. Lets get started with making the changes! Our skin contains a design used for the homepage and then a second design used for all the other pages in the site. The skin is design using Twitter Bootstrap 3 so we can then be responsive when viewing the site on a mobile device. 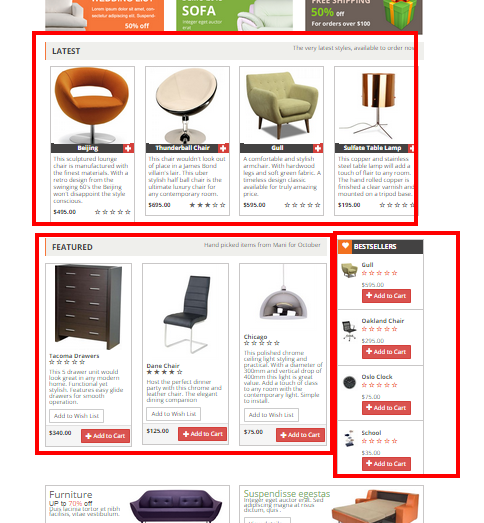 It also means we can enable the responsive mode of Cart Viper to make all the store front responsive too. 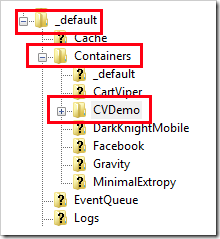 In the Site Setting - Appearance we set the skin to CVDemo - Main and we also set the container to the CVDemo - No Title container. Why buy a generic skin from the DNN Store when you can get a custom one cheaper? We got a custom made design using Twitter Bootstrap from a designer and then we just converted it to a skin ourselves all for less than the cost of an average skin on the store. Its a one off and designed to our requirements. We posted the job on People Per Hour and found our designer on there. Its the fastest and cheapest way to get quality results. The navigation menu used by the skin is a custom one we created using the DDR menu and a simple razor script. 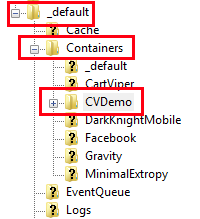 The script is located in the folder bootstrapNav inside the skin folder. We are using some code to get all the top level categories in Cart Viper and then we output these into the menu. We also have hard coded a link to a contact page which is just a DNN page on the demo site. 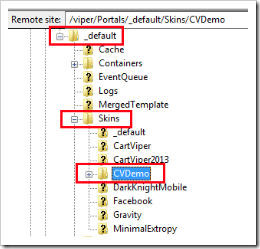 On the home page of the site we define the skin to use for this page to the CVDemo - Home skin so that gives us the different look to the rest of the pages within the site. At the top of every page we have the Search Input and Mini Cart control. These are not in fact Cart Viper modules, these are just two simple razor scripts that we have added to the header pane using the Razor Host Module which is part of the standard DNN install. Firstly copy over all the /RazorHost files in download at the bottom of the page to the folder. We’ll explain some more about all the files as we setup the home page of the site below. So just add two Razor Host modules to the pane at the top of the skin and then we just set one module to use the script CVSearchinput.cshtml and the other module to use CVMiniCart.cshtml. We have created a pane for each control namely searchInputPane and MiniCartPane and its those where you should place Razor Host modules. We are also going to set both modules to display on all pages of our site, so that these two controls are available on every page. Also if you look at the demo site, you’ll notice we have a link to the cart, wishlist and my account. This is done using the same idea. Just add a Razor Host module to the HeaderPane and define the script as CVHeaderLinks.cshtml then assign that module to all pages in the site. There are some other items we are going to add to the home page which give us some extra functionality when a customer first lands on the page. We have a Latest items, Best Selling items and Featured items. All three of these are creating using Razor Host modules and three scripts we have wrote that pulls the products from Cart Viper. The products for each of the scripts comes from a category we have defined in the CV back office. We have a root category called _Meta which we have made sure in our other scripts is never rendered to the store front. We then have a sub category in there which maps products to the razor script. It might sound complex but its very simple once you look at the razor scripts and the code we have written. We have made a lot of changes to the templates used in Cart Viper and added some razor scripts into the folders that the templates use. To set up those you just need to turn on Portal Templates and Responsive in the Store Admin – Store Info page. Note X will be the portal ID of the portal you are using. Please take a look at the html template files and the scripts sub folder to learn more about how we are making the store front. On the product details page we display a category submenu which lists any subcategories contained within the currently selected category. This again is a Razor Host module which we have added to the store page. The name of the script to use is CVCategorySubMenu.cshtml. 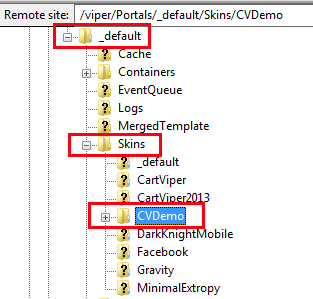 We never intended to give the skins and files used on the demo site, so we recommend that you try out all the changes and make sure they match your requirements and you use the files as a jumping off point for customizing your store further. With that in mind we have a couple of ideas where you could extend the templates and design. The navigation menu we use on the skin contains a hard coded link to a contact page, this could be changed to have some code which adds dynamicaly other pages defined within the portal. You could just edit the razor script /Skins/CVDemo/bootstrapNav/CVNav.cshtml to do this. On the product details template it would be good to add a related product selection, this could be as simple as using the name or keywords of the current product and doing a search against the catalogue for matching products then rendering those to the page. On the cart page you could add some razor script to attempt to upsell some special offer item based on the contains of the cart. A recent project that we have worked on is the ecommerce store for Action Handling. 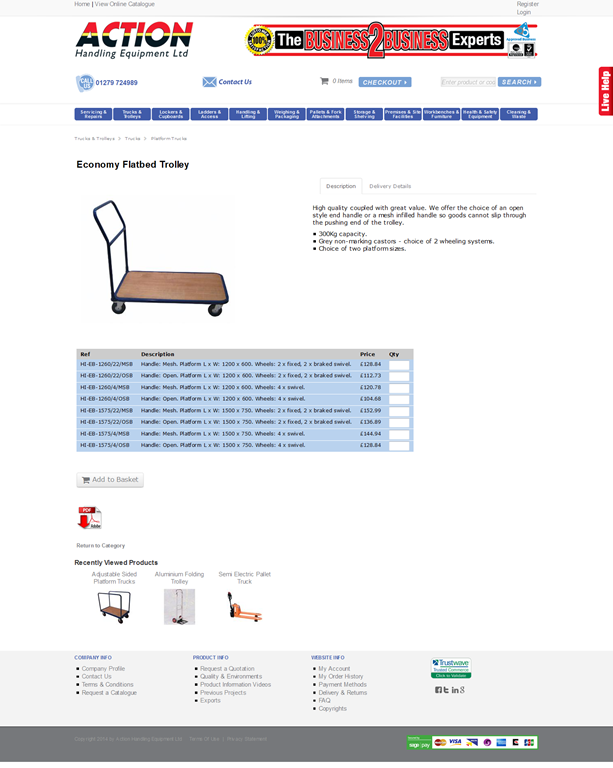 Action Handling sell over 11,000 items online related to storage and handling of materials using Cart Viper as the ecommerce store. We worked together with Sharon Ensbury to implement a complete solution for the client. Taking the designer’s mock-ups and converting these into the layout and functionality requirements for the store. Responsive design was incorporated to allow browsers on tablets, mobile devices and laptops to browse and purchase from the store. The store features a lot of custom Razor generated features which we are especially proud of. This demonstrates the power of Cart Viper and the new Razor support we have implemented. Here are some of the features and templates we created for the project. Due to the vast number of items and categories we created a custom menu using a mega menu layout to allow customers to quickly locate the category. Driven from the data stored within Cart Viper and render to the page using a custom Razor script. We replaced the standard category list view with a custom one, this allows the browser to switch between list and grid view as well as sorting. This goes to demonstrate how easy it is to change the layout of standard Cart Viper templates with custom ones using the built in template and Razor support. 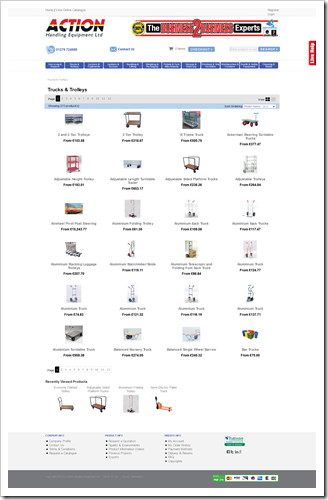 The standard product details page was replaced with a custom one which allows the customer to select the correct model from the range, view the specifications and watch any videos that are assigned to the product. Developing custom templates with Razor is fast and powerful giving you complete access to the data and DNN framework. The possibilities are endless to what you can achieve. This is what the implementation partner had to say about our us and our product. 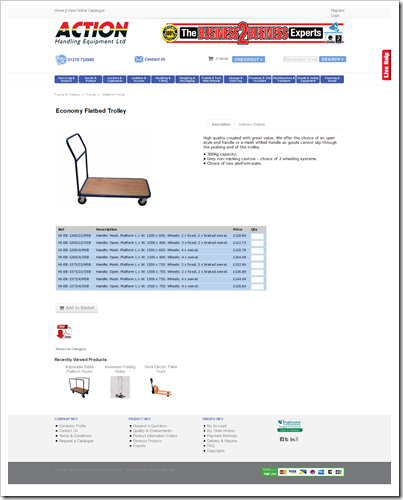 I looked at Cart Viper during the design stage of my material handling equipment website https://actionhandling.co.uk. I had used Cart Viper on a number of other e commerce websites but none of them were as complex as Action Handling. 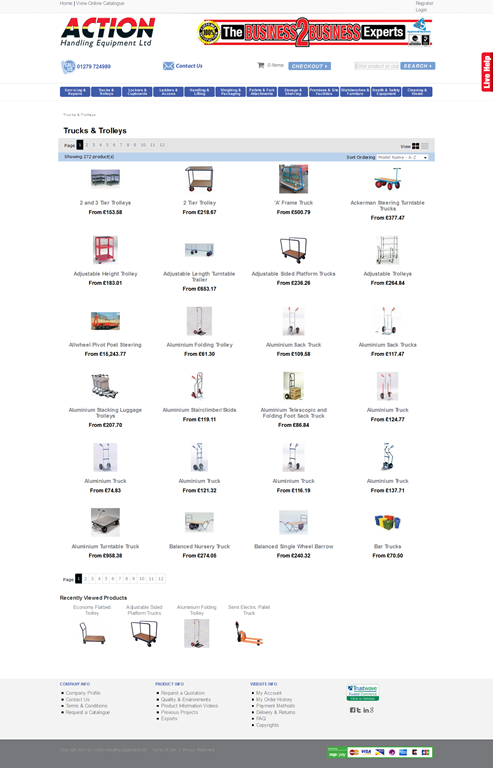 Action Handling has over 11,000 lifting and handling products and all of them have different variations and price structures. As well as all the usual product details we wanted to allow customers to download product pdfs and view videos for some products. We wanted to show product variations neatly in tables and wanted to easily update the product database when products and prices changed. We wanted customers to be able to pay via credit card or pay on account. We wanted to disable some functionality, change text, and add new functionality. Before starting the project I downloaded all the leading DNN E Commerce stores and compared them in a table against all of my client requirements. Cart Viper looked as though they were the only store that would meet most of the requirements. If I had any doubts as to whether the product had any shortcomings I needn't have worried. Cart Viper answered all my questions in a timely manner and filled me with confidence that I could make changes to the product templates and assured me that they would be there if I needed them to make any changes that were not straightforward. We have ended up with a fantastic looking site and Mark McAvoy has been an absolute star ensuring that all the customer requirements were met and ensuring our responsive skin and Mega Menu was integrated with Cart Viper and everything works well on mobile, tablet and desktop computers. As if that wasn't enough Mark has not just followed our instructions, if he thought something could be done in a better way he told us. This was an extremely enjoyable project. Dee Jones Design was responsible for the design, Action Handling had their ideas of how the website would look and tested the functionality met their business model and processes, and Cart Viper were an important part of that team. I would recommend Cart Viper to anyone considering adding a E Commerce functionality to a DNN website. We are ready to work with you on your ecommerce project, we have the product and we have the skills to make a winning solution. Its just under a week since we released the new version of Cart Viper (Version 3.1) and we’ve already had some very positive feedback from our customers. We just wanted to say a thank you to all the people that voted for the various features on our road map. We had a total of nine items that received votes, of which 8 items are now available in the Cart Viper 3.1. The ninth item that was voted for (support for the Stripe Payment Gateway), was after the deadline for new features. We’ve moved this feature into the roadmap for version 3.2. We do listen to our customers and you shape our direction and product enhancements. The road map has been updated again with planned features for version 3.2 and 3.3. We need your votes! 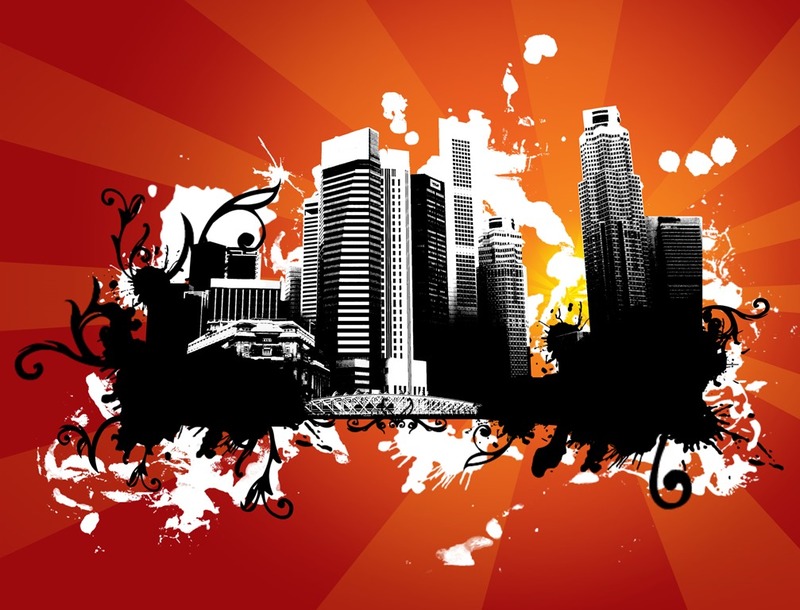 If there is a feature you would like to see then contact us and we can add it to the list. We are pleased to announce that the latest release of Cart Viper 3.1.0 is now available. This release contains new features, improvements and bug fixes that build upon our existing module. Razor Support – We now have built-in support for using Razor files in the templates. You can now easily perform advanced customisations of the store using your own snippets. We’ll be creating some examples using Razor other the coming weeks. Predictive Search – As the site visitor types into the search field we suggest terms based on the content of the index. 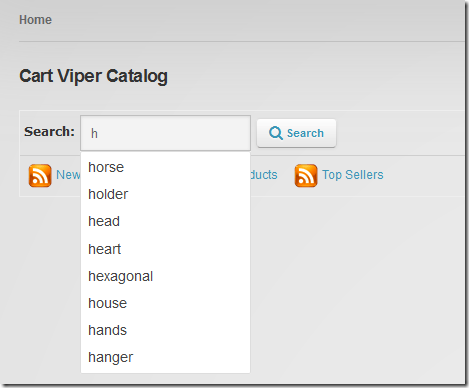 Category Menu – The category menu in Cart Viper can now be rendered with a Razor script, so you can output the catalogue categories however you like and use custom jQuery plugins for example to style the menu. Cloud Digital Downloads – Store digital download files in the cloud and give paying customers secure access to download the file directly from Amazon S3 or Azure. Medium Trust Support – We have restored support for medium trust sites. Speed Improvements – The store will run even quicker in this latest release. We have managed to improve the performance even further. 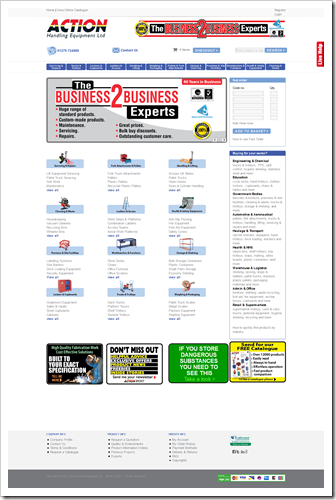 If you are an existing customer then you can download the latest release from the free trial page. Cart Viper is ecommerce module for the DNN Platform which turns your CMS website into a revenue generating source. With simple setup its easy to start selling with plenty of advanced features to help turn your browsers into paying customers. What do printers, mobile phones, video game consoles and razor have in common? They all use the razor blade business model, selling a commodity cheap to generate revenue on complementary products. The initial cost of purchasing a new printer is tiny compared to the cost of purchasing ink or toner over the life time of the printer. Its a tried and tested model that works, so long as the original product isn’t modified to cut the manufacturer out of the loop with purchasing the complementary product. If you start using refilled ink or toner the manufacturer loses out on the revenue and its no longer a great deal for them. So what does any of this have to do with Cart Viper? Well a common question we get asked is what is our upgrade policy for Cart Viper. Simple, its the opposite of the razor blade model. If you purchase a license you get free lifetime upgrades. That’s correct, purchase a license and you’ll get access to every release we create in the future. Not just bug fixes, but new features as they become available. All for the single one off license cost. We have an active road-map of new features, a frequent release cycle and great support, so let us help you with your next ecommerce project. Ask our competitors about what their upgrade policy is, are they following the razor blade model? Today we have launched a new feature on the Cart Viper website. We are committed to listen to our customers and we have now made it easier for you to help shape the direction of Cart Viper. 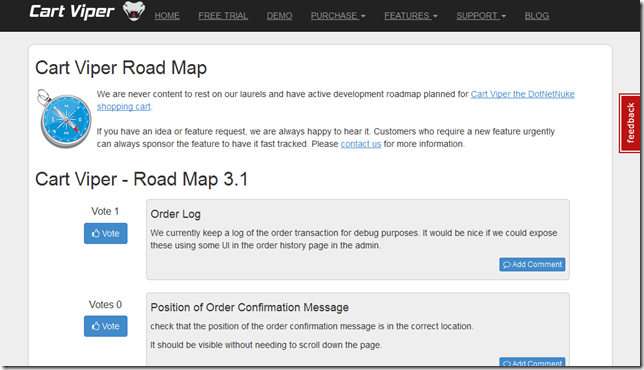 The new road map page allows you to view, vote and comment on tickets which we are working on for future releases. Do we have a task which is important to you? We want to see your votes and hear your comments. Cart Viper is an ecommerce module for DNN which provides you with the ability to sell anything online, With features you would expect to find in a product costing ten times the price. Cart Viper 3.0.0 now has support for responsive layouts, allowing you create a store that works great desktop, tablet and mobile users. The world of computing is changing, no longer do you need a desktop computer to access the internet. Tablet and mobile devices are growing at an incredible rate. The challenge to a store owner is how to tap into the market and provide a first class experience for the ever expanding tablet and mobile users. One option is to design a website using responsive layout to allow for an optimum layout and use of space across all devices. Starting in Cart Viper 3.0.0 we are now able to render a store using responsive templates which allow all different devices to browse and checkout from the store. Its important to understand that the responsive templates in Cart Viper have a dependency on Twitter Bootstrap 3.0.0 or greater. Cart Viper does NOT load the Twitter Bootstrap CSS file, the skin of the site must be responsive and it is that which is responsible for loading the CSS file. Older versions of Twitter Bootstrap are not supported, the minimum version required is Twitter Bootstrap version 3.0.0. 1. Log in to the Store Admin page select the Store Info option, from here you will see that their is the ability use the original templates or the new responsive templates. 2. 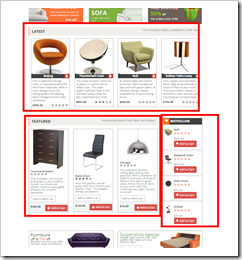 Select the responsive option and the store will now use those to render the page. Additionally you are free to edit the templates to tweak the layout as required. Cart Viper ships with a number of checkout types used to finalize and place the order, Four step, Three step and Single step, only Single step checkout is responsive since this is the preferred checkout option in Cart Viper. Cart Viper is the most cost-efficient and feature rich ecommerce module for DNN, this latest release goes to prove it. Our commit to constant improve means you get the best possible store on the DotNetNuke platform. Take the free 14 day trial and see the benefits Cart Viper can bring to your store.